Advice From A Vet On The 'Rude Awakening' Of Transition To Civilian Life Cameron Cook just got his discharge papers after a 23-year career in the U.S. Army. 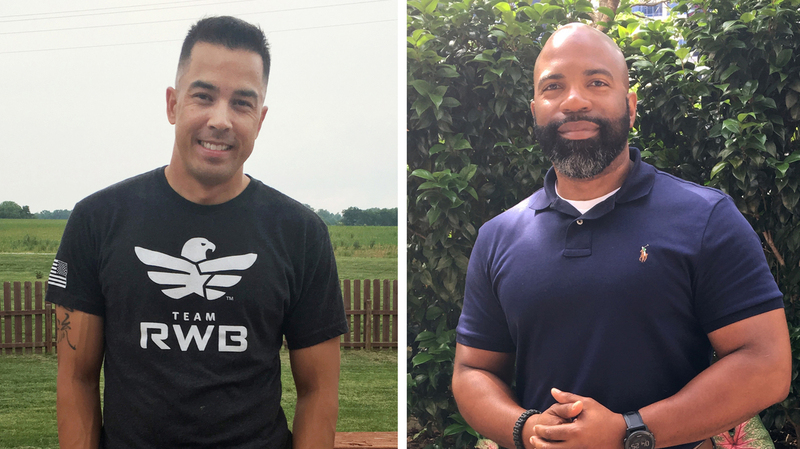 He talks with retired Army medic Jarrad Turner about the ups and downs of returning to civilian life. Cameron Cook signed up for the U.S. Army in 1994, three days after his high school graduation, and that's been his life ever since. The job took him to Germany, Macedonia and Albania. He did combat deployments in Iraq and Afghanistan. Cameron says it came with a sense of purpose, camaraderie and excitement. "It's just been something new every day, every month, every year," he says. "Whether it was a new job skill, go get a new piece of equipment. It's like Christmas every week in the Army." That's all about to change. Cameron is retiring. Are you about to undergo a major life change, like start your own business or enter a retirement home? Or have you gone through a big change already? All Things Considered invites you to share your experience, either to ask questions or pass on your own lessons learned. Email us at nprcrowdsource@npr.org, with "Been There" in the subject line. "For me it was a rude awakening," he tells Cameron, "because I kind of had the mentality of, OK, slackers, get up! I was like, you're wasting time! We've got stuff to execute upon." When I got out, my son — so he was 4. You know, being 4, he was still in dad's arms, you know. And kind of just falling asleep on the couch with him is one of the things that started to break some of those old patterns. You know I'm looking at my kids, and I'm like, I'm looking at my family, I don't want to lose this precious time. So, it's like just chill out. I don't think that they do it intentionally. You know, a lot of times they're just trying to help out. But, when you start telling them, because you're trying to help them get a better understanding, and you say, "Well, when you're in boots, you know, you're in that big dust bowl and you lose people, unfortunately that body goes somewhere else and you still got a mission on," a lot of them just don't get that. And it can frustrate you, but I just kind of take it from a place that look, they just don't understand. They're trying to get a better understanding of it. So, when I can talk about it I talk about it, and when I can't I just can't. Having a support system that you can trust — family, your bros, veterans' organizations — that is truly the reason that I'm still here. I buried my tenth soldier to suicide, Dec. 24, we buried him. I mean, to this day it still hurts. But, I would say, there's gonna come times in your life now that you just need to be brutally honest with people. Whether it's pain, whether it's memories, whether it's life, there's a time when this stuff can come back on you. And, if you're willing to just talk about it, and understanding that it doesn't necessarily have a rhyme or reason to it, you'll be good.